How To Use OpenSSL s_client To Check and Verify SSL/TLS Of HTTPS Webserver? OpenSSL provides different features and tools for SSL/TLS related operations. s_lient is a tool used to connect, check, list HTTPS, TLS/SSL related information. Simply we can check remote TLS/SSL connection with s_client . In this tutorials we will look different use cases of s_client . The basic and most popular use case for s_client is just connecting remote TLS/SSL website. We will provide the web site with the HTTPS port number. 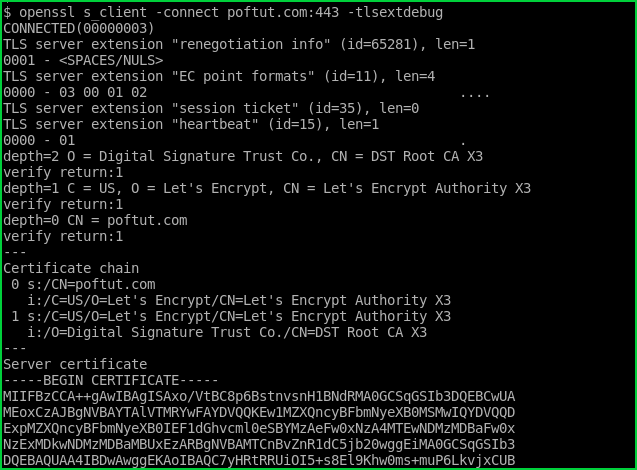 In this example we will connect to the poftut.com . If the web site is certificates are created in house or the web browsers or Global Certificate Authorities do not signed the certificate of remote site we can provide the signing certificate or Certificate authority. We will use -CAfile by providing the Certificate Authority File. We can use s_client to test smtp protocol and port and then upgrade to TLS connection. We will use -starttls smtp command. We will use following command. HTTPS or SSL/TLS have different sub versions. We can enable or disable the usage some of them. In this example we will disable SSLv2 connection with the following command. Like previous example we can specify the encryption version. In this example we will only enable TLS1 or TLS2 with the -tls1_2 . We can specify the cipher with the -cipher option like below. We can also specify the hash algorithm of the encryption protocol. In this example we will only enable RC4-SHA hash algorithm for SSL/TLS connection. We will use -cipher RC4-SHA . While a SSL/TLS connection is made there is a lot of operation under the hood. If we have some problems or we need detailed information about the SSL/TLS initialization we can use -tlsextdebug option like below.